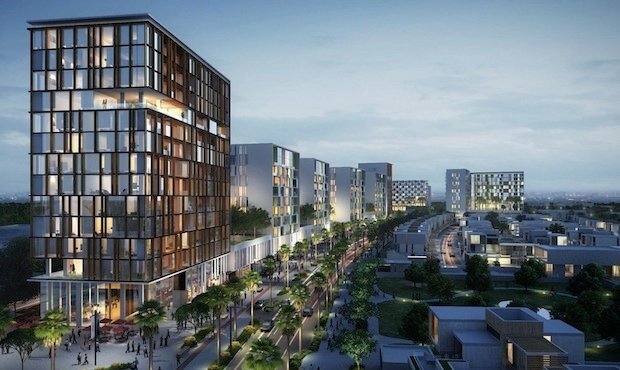 Dubai South has revealed that apartment prices at its new residential project, The Pulse, will begin from Dhs280,000. The project was unveiled by the developer during Cityscape this year. Dubai South will begin the sale of units at The Pulse in the end of September, “following tremendous response and keen investor interest,” it said in a statement. The portfolio of units up for sale will include studios, one, two, and three bedroom apartments, as well as two and three bedroom tiered townhomes within a secure gated community. The units will be ready for occupancy in 2019. Situated in the Dubai South Residential District, The Pulse is a mixed-use project centred around a 70-metre wide, six-lane boulevard. Along with residential units, the community will also feature retail, hospitality and leisure elements. Residents of The Pulse will have easy access to a retail centre, a sports centre and a community centre, a school, gas station, hospital, mosque, nursery, mall and hotels, the statement said. Billed as a ‘city centred around the happiness’ of its people, the massive 145 sqkm Dubai South development is located five minutes from the Expo 2020 site, close to the Al Maktoum International Airport, Jebel Ali and Dubai Parks and Resorts. Earlier this month, developer Emaar also teamed up with Dubai South to launch a huge golf course community within the overall development called Emaar South. The project will feature more than 15,000 residences across six districts anchored by an 18-hole championship golf course and clubhouse, community parks, retail precincts and three and four star hotels.